MAwuiAiCttfftïû BY .VTh G.-iíriüfj, ST. Petersburg-, I S 5 I E^iíibiiriüs. 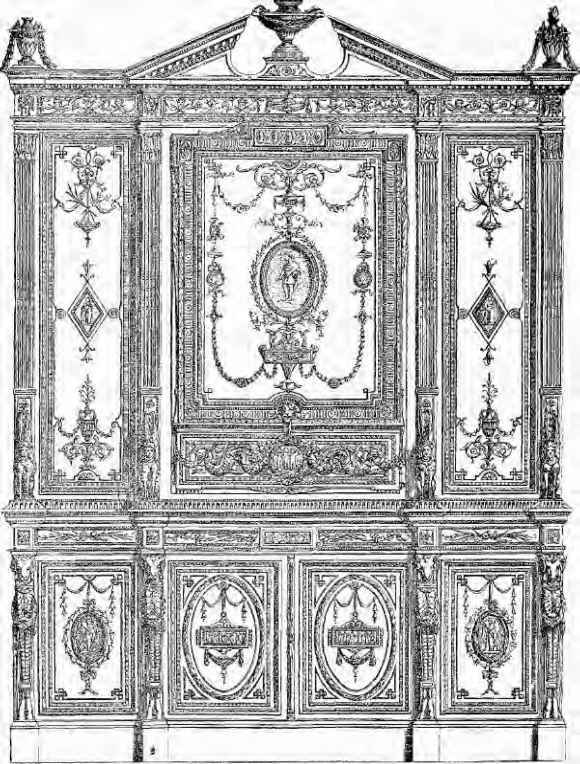 The design and execution of mountings of cabinets in metal work, particularly of the highly-chased and gilt bronzes for the enrichment of meubles de luxe, was then, as it still to a great extent remains, the specialite of the Parisian craftsman, and almost the only English exhibits of such work were those of foreigners who had settled amongst us. 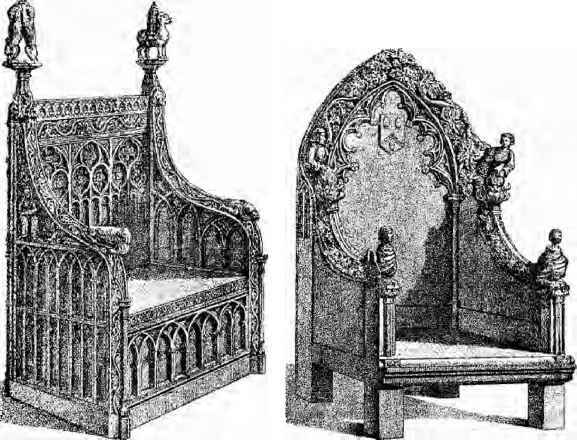 Amongst the latter was Monbro, a Frenchman, who established himself in Berners Street, London, and made furniture of an ornamental character in the style of his countrymen, reproducing the older designs of "Boule" and Marqueterie furniture. The present house of Mellier and Cie. are his successors, Mellier having been in his employ. 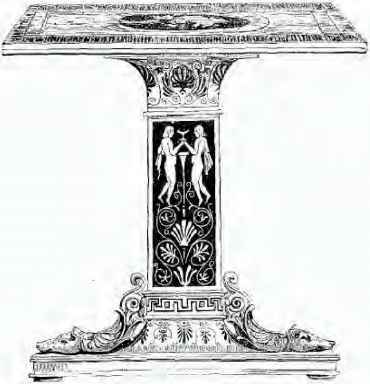 The late Samson Wertheimer, then in Greek Street, Soho, was steadily making a reputation by the excellence of the metal mountings of his own design and workmanship, which he applied to caskets of French style. 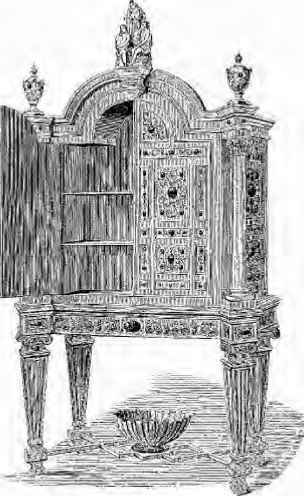 Furniture of a decorative character and of excellent quality was also made some forty years ago by Town and Emanuel, of Bond Street, and many of this firm's "Old French" tables and cabinets were so carefully finished with regard to style and detail, that, with the "tone" acquired by time since their production, it is not always easy to distinguish them from the models from which they were taken. Toms was assistant to Town and Emanuel, and afterwards purchased and carried on the business of "Toms and Luscombe," a firm well-known as manufacturers of excellent and expensive "French" furniture, until their retirement from business some ten years ago. cabinet of hbo/v* , pi tkk liv.^alnr-.yxce lltle Wilt C-a i'L|J kin;- inJ^i [Qlr I^i Jelyffii. 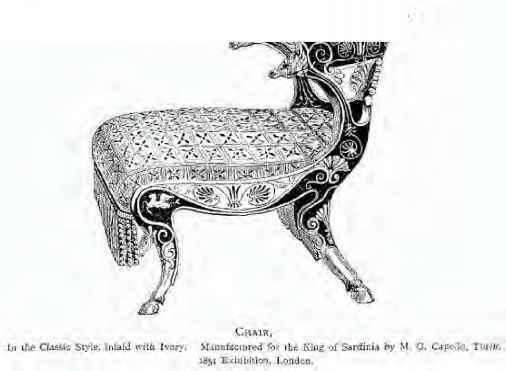 Webb, of Old Bond Street, succeeded by Annoot, and subsequently by Radley, was a manufacturer of this class of furniture; he employed a considerable number of workmen, and carried on a very successful business. The name of "Blake," too, is one that will be remembered by some of our older readers who were interested in marqueterie furniture of forty years ago. He made an inlaid centre table for the late Duke of Northumberland, from a design by Mr. C. P. Slocornbe, of South Kensington Museum; he also made excellent copies of Louis XIV. furniture. The next International Exhibition held in London was in the year 1862, and, though its success was somewhat impaired by the great calamity this country sustained in the death of the Prince Consort on 14th December, 1861, and also by the breaking out of the Civil War in the United States of America, the exhibitors had increased from 17,000 in '51 to some 29,000 in '62, the foreign entries being 16,456, as against 6,566. Exhibitions of a National and International character had also been held in many of the Continental capitals. There was in 1855 a successful one in Paris, which was followed by one still greater in 1867, and, as every one knows, they have been lately of almost annual occurrence in various countries, affording the enterprising manufacturer better and more frequent opportunities of placing his productions before the public, and of teaching both producer and consumer to appreciate and profit by every improvement in taste, and by the greater demand for artistic objects. The few illustrations from these more recent Exhibitions of 1862 and 1867 deserve a passing notice. 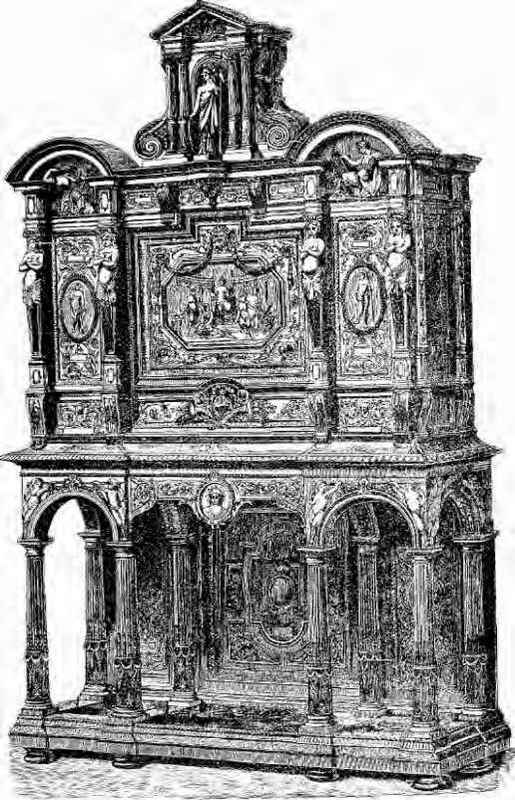 The cabinet of carved ebony with enrichments of carnelian and other richly-colored minerals (illustrated on previous page), received a good deal of notice, and was purchased by William, third Earl of Craven, a well-known virtuoso of thirty years ago. 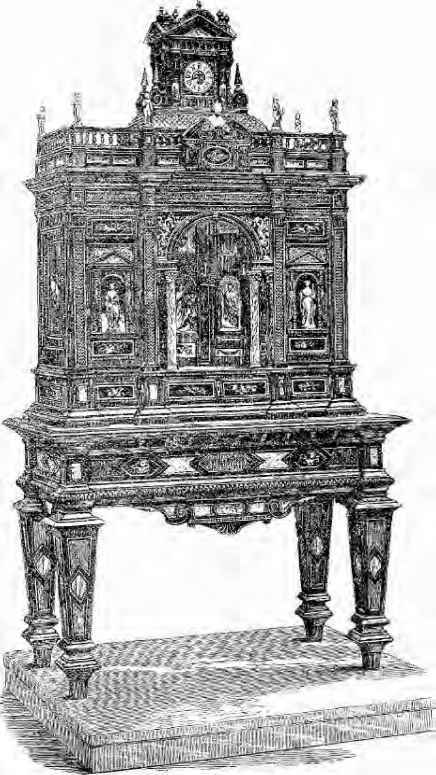 The work of Fourdinois, of Paris, has already been alluded to, and in the 1867 Exhibition his furniture acquired a still higher reputation for good taste and attention to detail. The full page illustration of a cabinet of ebony, with carvings of boxwood, is a remarkably rich piece of work of its kind; the effect is produced by carving the box-wood figures and ornamental scroll work in separate pieces, and then inserting these bodily into the ebony. By this means the more intricate work is able to be more carefully executed, and the close grain and rich tint of Turkey boxwood (perhaps next to ivory the best medium for rendering fine carving) tells out in relief against the ebony of which the body of the cabinet is constructed. This excellent example of modern cabinet work by Fourdinois, was purchased for the South Kensington Museum for £1,200, and no one who has a knowledge of the cost of executing minute carved work in boxwood and ebony will consider the price a very high one. 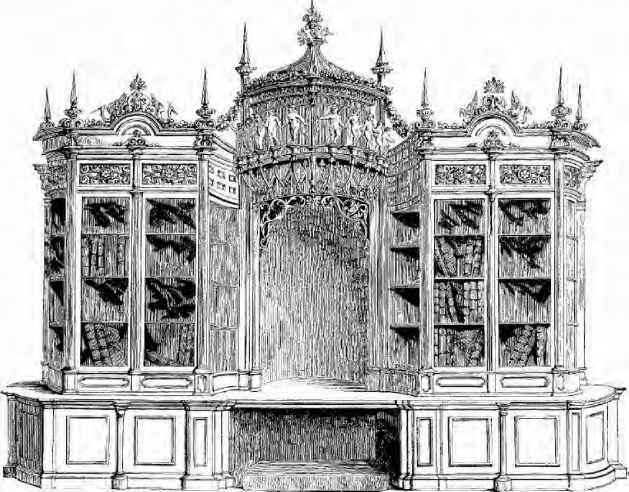 The house of Fourdinois no longer exists; the names of the foremost makers of French meubles de luxe, in Paris, are Buerdeley, Dasson, Roux, Sormani, Durand, and Zwiener. 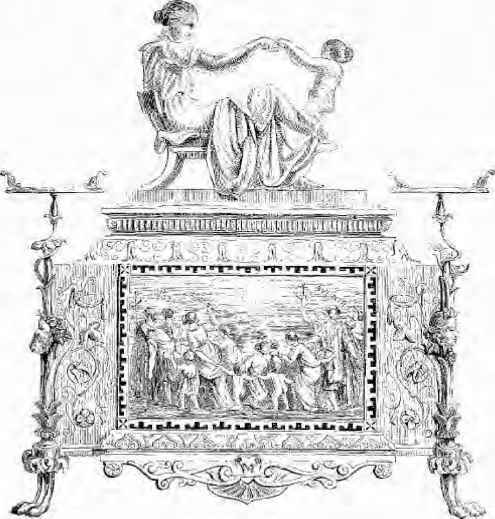 Some mention has already been made of Zwiener, as the maker of a famous bureau in the Hertford collection, and a sideboard exhibited by Durand in the '51 Exhibition is amongst the illustrations selected as representative of cabinet work at that time. lJUKf!Üéuíaj'' "ILJL. S- KEiít'jjovi.Lisí MdütUüi.